Continuous Fiber Winding Technology is the method of winding fibers on an automatically controlled and continuously revolving mould. 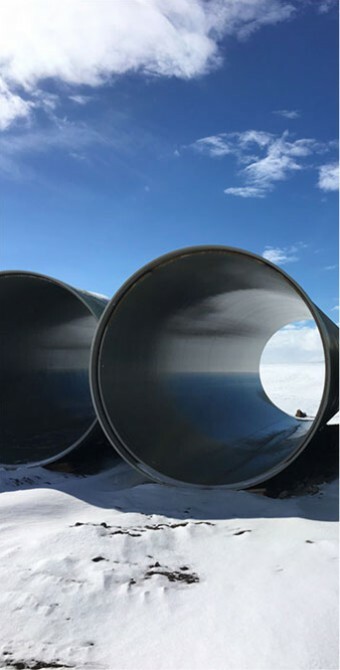 Fiberglass wound around the inner and outer resistance layers in order to ensure the pressure withstand and rigidity of the pipe and the clipped fiberglass used at all layers to ensure axial resistance are connected via the thermoset polymerization reaction of the polyester. Filling agent (silica sand) is used at the middle layer to improve the pipe's rigidity economically. 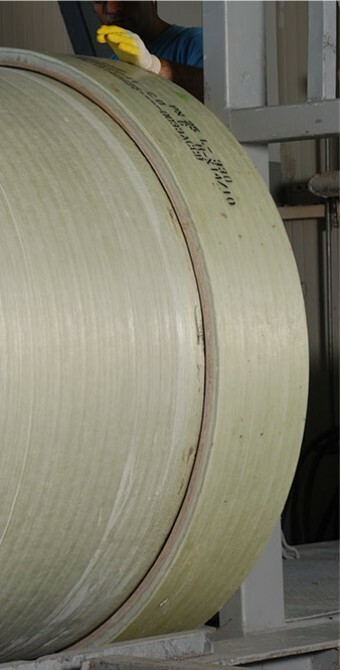 Amongst the various production techniques in Glass Fiber Reinforced Polyester (GRP) pipe production, Continuous Fiber Winding Technology used by Subor is the most developed technology with regards to performance, quality, speed, and economy. In production, "polyester resin", "glass fiber," and "silica sand" is used as raw materials. Pressure (PN) 1 - 32 Atm. Thanks to the advantage provided by continuous fiber winding technology, Subor is capable of production suitable for the technical specifications of any project at any desired length, pressure, and rigidity. These can be laid under or above ground as well as under the water. They may be laid into the existing pipes during relining. When Subor GRP pipes are mounted, they are joined to each other via joint systems with REKA type GRP couplings that ensure absolute sealing. GRP couplings produced with the technique used in GRP pipes are prepared at the cutting and grooving machines and then are subjected to leakage tests under pressure. Sealing in couplings are ensured with gaskets from elastomeric materials. This property of the gaskets allow certain angular deviations of the couplings and prevent the reflection of stresses encountered in ground subsidence and earth movements such as earthquakes directly on the pipes. REKA type GRP couplings offers the opportunity to make quick, simple, and safe connections in every ground and weather conditions compared to the alternatives. Full sealing is ensured via sleeve connections with gaskets. It is expandable. It was successfully applied at earthquake sites. Subor GRP pipes are used in fittings such as standard elbows, T, reduction, flange, etc. as well as special spools that can be designed on request. For fitting production, pipes are first cut at the desired angles and forms. The cut pipes are attached by connecting glass fiber mat (CSM), glass fiber webbing-lattice (WR), and glass fiber multiaxial materials to each other by polyester recin. This practice is called "Lamination Method". Subor obtained a patent in 2009 and started applying the new method that allows obtaining high resistance at connection points using multiaxial (resistant in three axes) materials that was developed with extensive long-term tests by the Subor Technology Center. Multiaxial fiber materials are cut at the desired dimensions in automated, computer-controlled cutting machines. Thus, possible cutting and workmanship faults are prevented and losses are reduced. Upon the completion of lamination process, fittings are taken into the post-cure furnace and the reaction is completed. With this practice, the resistance of the winding layers increase and the new method makes it possible to produce fittings at higher pressure classes. Another advantage of SUBOR pipes is that they allow production of standard as well as non-standard fittings in a very wide range. Such non-standard pieces, which we call spool and which are used mainly at power plants, are manufactured after having been developed with special engineering designs. T-pieces with nozzle outlet, tangential T, applying ribs on pipes, lug practices that facilitate under-the-sea assemblies are examples to this. 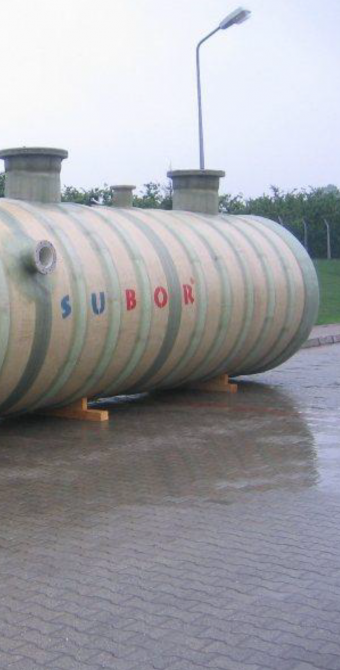 On the other hand, SUBOR has the means for tank and silo production for under and above ground applications. 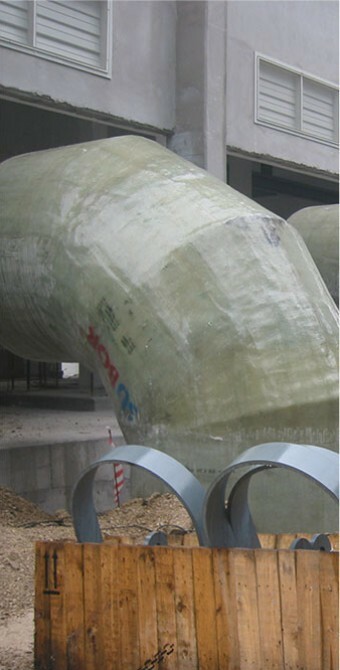 In parallel with pipe production, rib (rigidity-increasing strap) is applied on the tank pipes manufactured for various rigidity groups using the same raw materials and process technique or both mouth parts are covered applying glass fiber mat and glass fiber webbing-lattice materials together with polyester resin. Glass Fiber Reinforced Polyester Tanks and silos may be used for gas, fuel oil, airplane fuel, potable water, or waste water storing and many other purposes. Since it is not affected by corrosion, GRP tanks have a relatively long service life without additional maintenance costs in comparison to other materials. Thanks to the advantage provided by Continous Fiber Winding Technology, Subor is capable of production suitable for the technical specifications of any project at any desired length, pressure, and rigidity. Diameter (DN): 300 – 4,000 mm. Provided by Continuous Fiber Winding Technology, Subor is capable of production suitable for the technical specifications of any project at any desired length, pressure, and rigidity. Diameter (DN): 300 – 4.000 mm.